After visiting some of the beautiful colonial towns in Central America, I couldn’t get enough of them! I reached out to our followers for the best places to visit with similar vibes in South America. 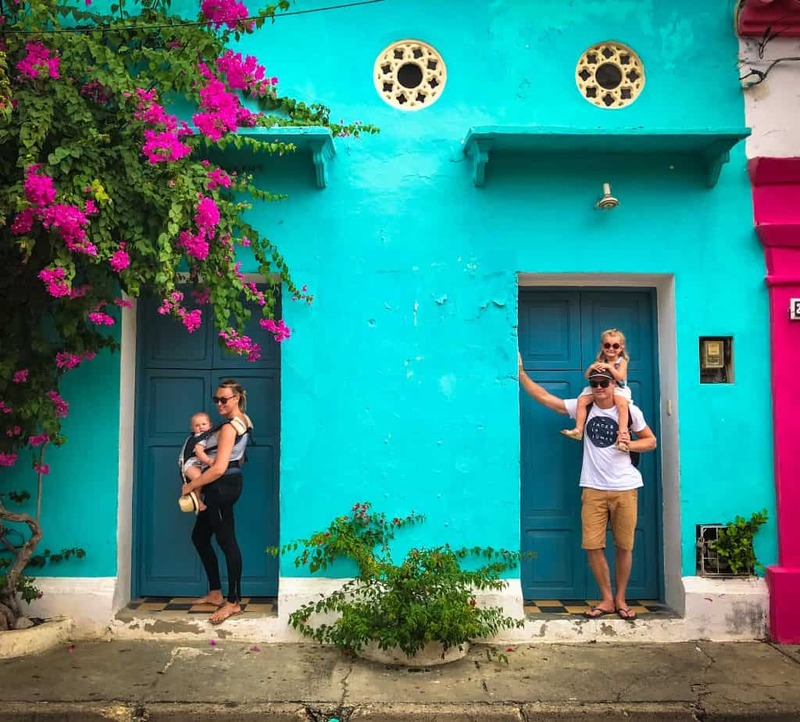 Cartagena, Colombia with kids came up time and time again, so we locked it in and arrived on New Year’s Eve! We stayed in several places inside the walled town, Getsemani and Bocagrande by the beach. In truth, we didn’t enjoy Bocagrande, but we loved the old town and Getsemani. 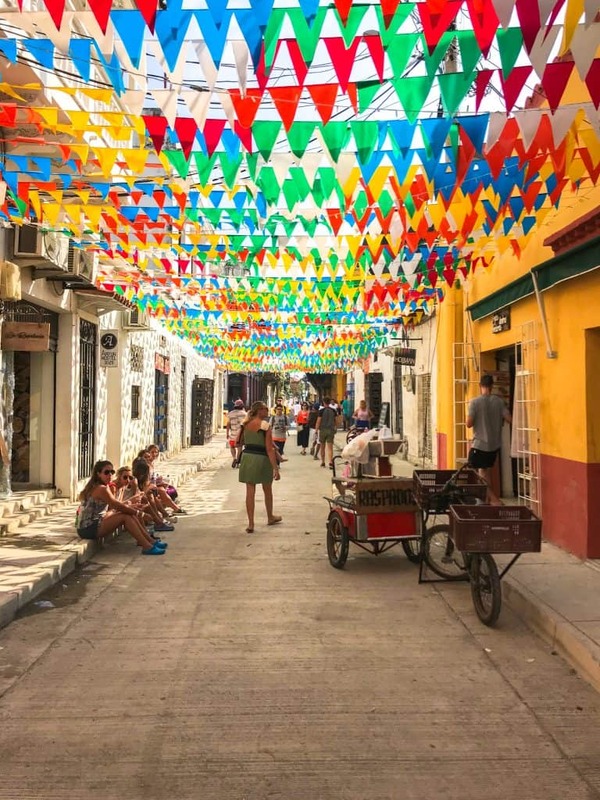 We wandered the streets most days and discovered every nook and cranny to be found in Cartagena. We found the best things to do in Colombia. Wether it was a good restaurant, the best arepas or ice-cream parlour, we found it after spending such a long time there. The colonial and tropical combination of Cartagena makes it a well-rounded experience. From the nearby Rosario Islands to the walled city, there is something for all types of tourists. 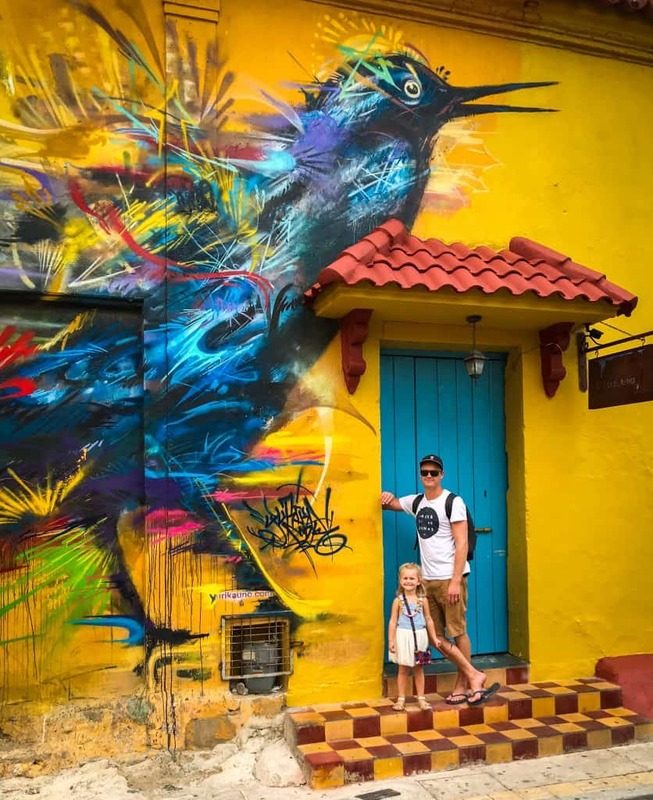 This is our play, sleep and eat guide to Cartagena, Colombia with kids. We spent our first night, NYE, staying in a casa in Getsemnani. It’s a cute little neighbourhood where many of the local Cartagenan’s live. It’s most famous for the beautiful street art, vibrant and colourful buildings and amazing street food. When we first arrived, it was buzzing. Many of the local families had pulled rocking chairs outside their door with a speaker playing Latin music. There was bunting on all of the streets. It was such an awesome place to be during New Year festivities. We revisited a few days later and I was expecting it to be different on a normal afternoon, but it was just as vibrant and fun. 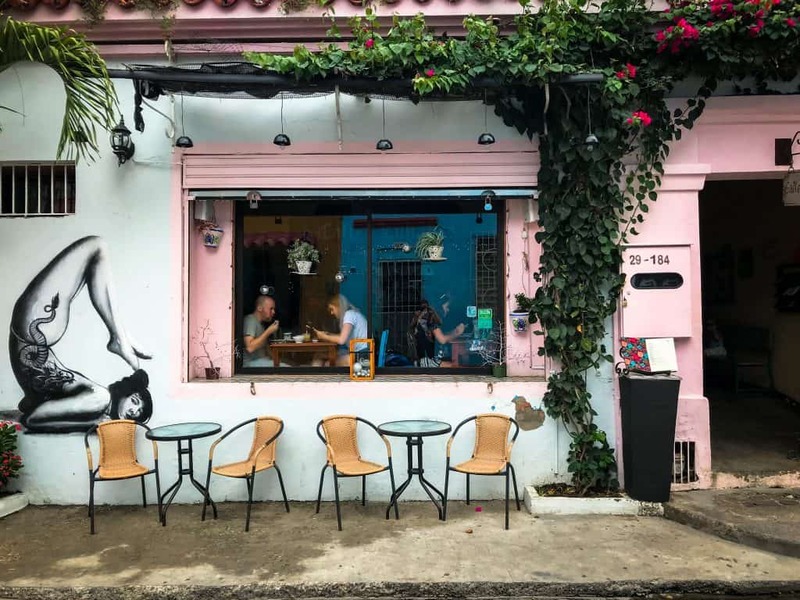 Getsemani consists of four or five streets that has all of the street art, so its easy to make it a morning activity, followed by a nice lunch. 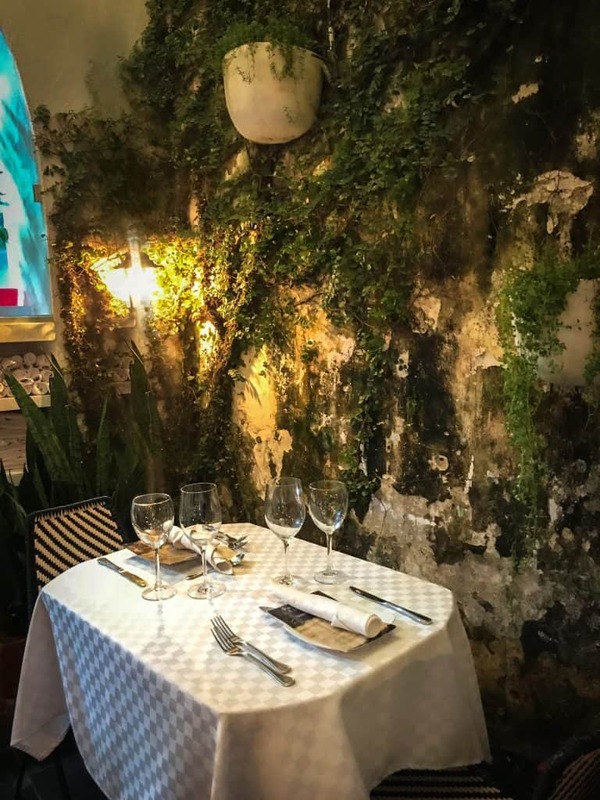 One of my favourite restaurants in Cartagena was in Getsemani, covered under eat below. It’s also really well known for its salsa dance club, not that we had time for that with two kiddos, but I bet its fun! If you can visit Getsemani in the evening, they have live music in the square. Many of the restaurants have tables outside so you can soak up the atmosphere. There are plenty of children and other families around, it’s an ideal place to hang out with little ones. 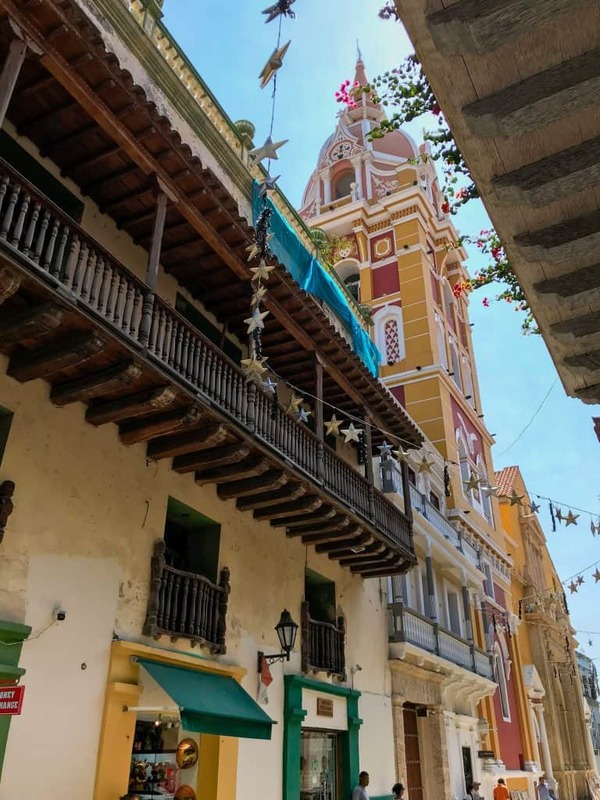 The walled historical Old Town of Cartagena is filled with every Colombian experience you could possibly want. Picturesque ancient streets, bustling squares, crumbling colourful paints and mesmerising architecture. Not to mention street vendors selling tantalising ice-cold and freshly squeezed lime juice, refreshing coconuts and oodles of gastronomic delights. Cartagena is at the cutting edge of culinary trends and thats something we enjoyed the most. We loved wandering the streets and albeit super touristy, the women dressed in traditional Colombian attire and perfectly arranged fruit bowls on their head, brought a spark to the place. 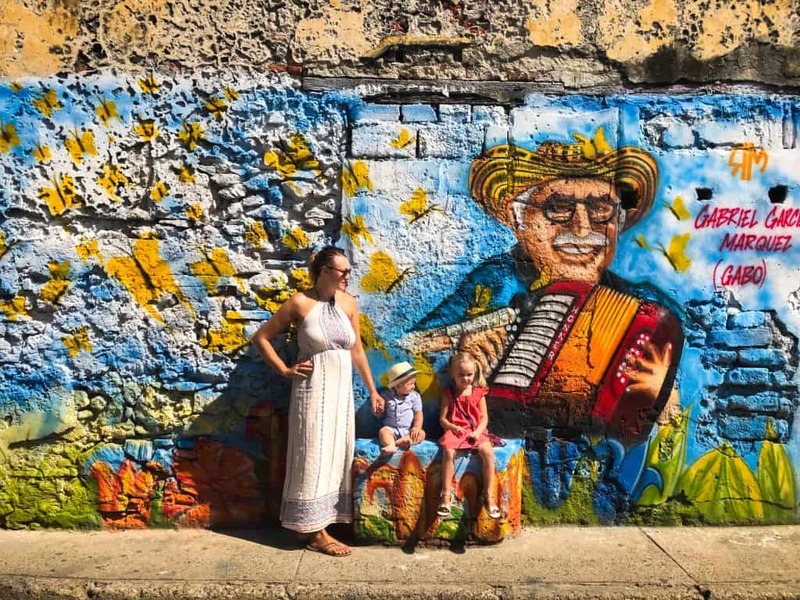 Latin music can be heard from nearly every restaurant, shop or bar and the locals are always jiggling their hips making it such a happy and vibrant place. It seem to put a smile on everyones face. Visiting as part of a larger Colombia trip? Check out this guide to the Best of Colombia. The wall around the edge of the town is not ideal for kids but many people walk along it to see inside and outside the perimeter. There are several architectural wonders that are not be missed in or around old town. The small group of Rosario Islands are just off the coast of Cartagena. Boating day trips to the tropical paradise is a very popular activity for Cartagena tourists. There are many companies that rent out privately, or, there are also many tours as part of a group. During the holiday season, it’s very hard to secure anything and its also a lot more expensive. The group trips leave at 9am and return at 5pm. Generally the price includes transport, lunch, snorkel gear and a hangout spot at one of the hotels on the other side. The day is quite long for little kiddies, just something worth considering. If you are looking for a longer stay on a more exotic Colombian Island you can check out Provencia Island, Colombia! We visited the Plaza mall very close to San Felipe Castle. It was more like a massive playground than a mall! They had everything you can imagine for kids. 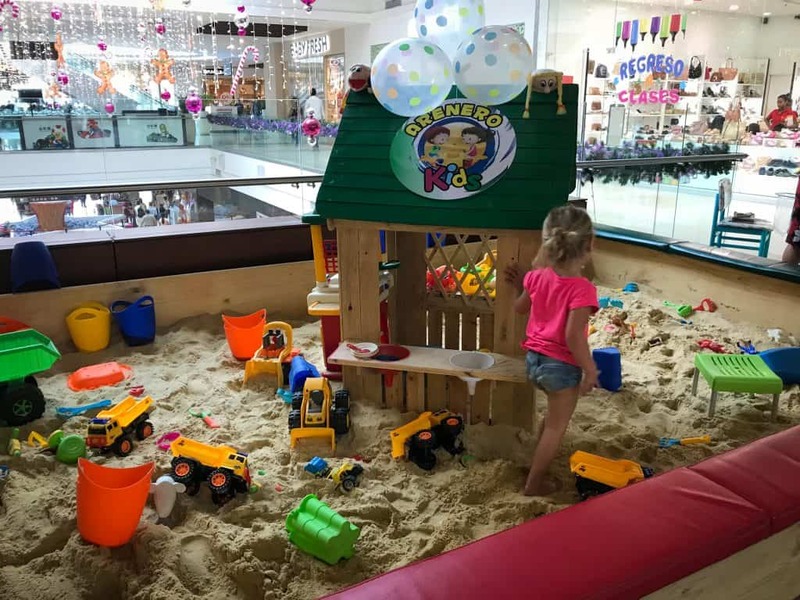 Sand pit with big dumping trucks, a huge soft place area, rides, moving stuffed animals and virtual reality experiences. 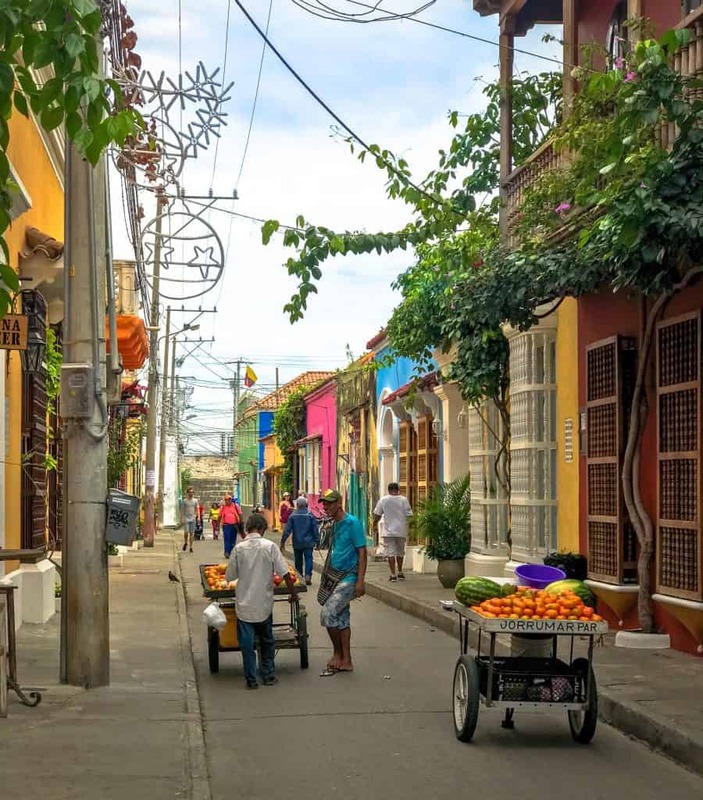 Looking to take an organized tour while in Cartagena? Check out the array of unique tours offered on Get Your Guide! 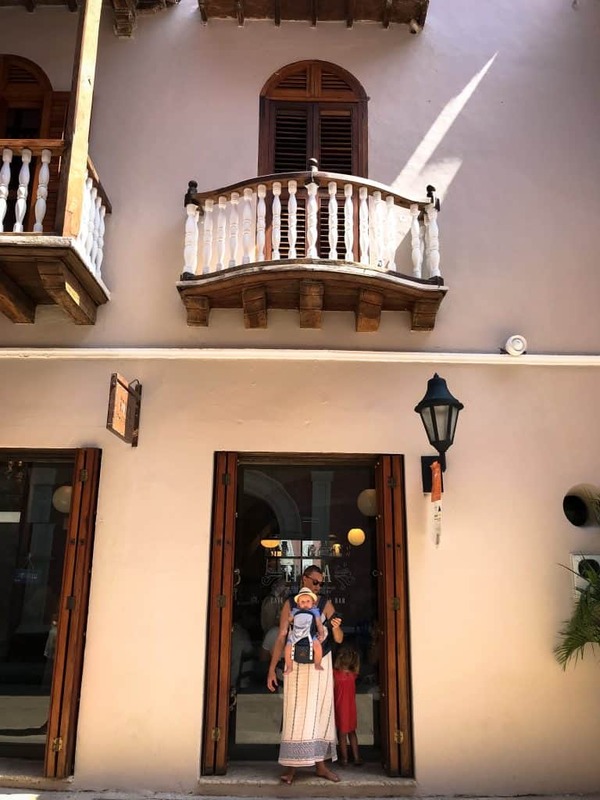 We stayed in four different places throughout our stay in Cartagena. Our longest stay was in a luxury penthouse inside the walls of the old town. It was in an ideal location, on one of the nicest streets. 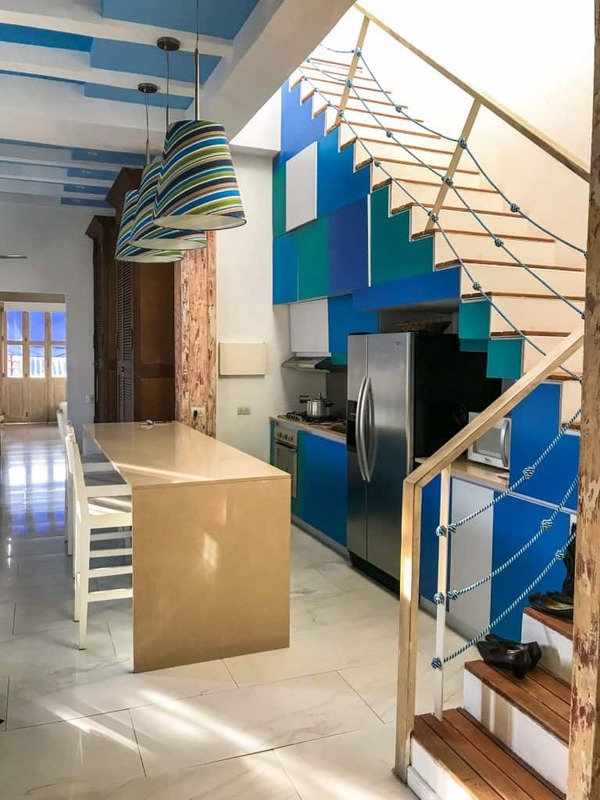 Split over two levels, it had three bedrooms, three bathrooms, open plan living, dining area and the most epic roof top terrace. We shared the place with our friends and took the room upstairs with the sweet views and they took the two rooms downstairs. It worked out perfectly for both our families sharing. There was ample space with lots of different spots to chill. The hammock in our bedroom was my favourite spot. 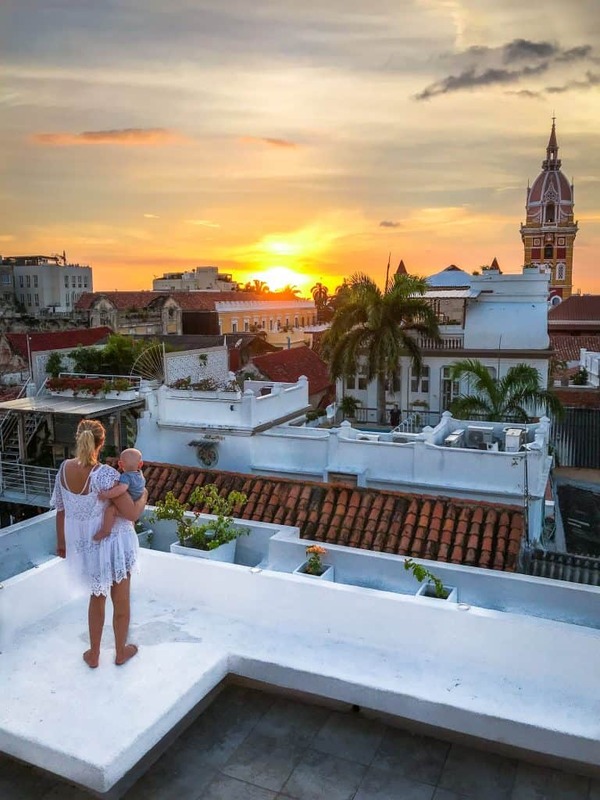 Check this out for more insights into where to stay in Cartagena. The penthouse was fully equipped with everything that makes travel with kids easy. Washing machine, kitchen and a cot. It did get a little noisy in the evenings because of the location. On a personal level, it didn’t bother us, but if you’re a light sleeper it might be a little disturbing. There is a tiny swimming pool on the roof, but it was having some issues with filtering whilst we were there. Neither of these things upset our stay, but I always like to mention them so there’s no surprises. For rates and availability on this property, click here. 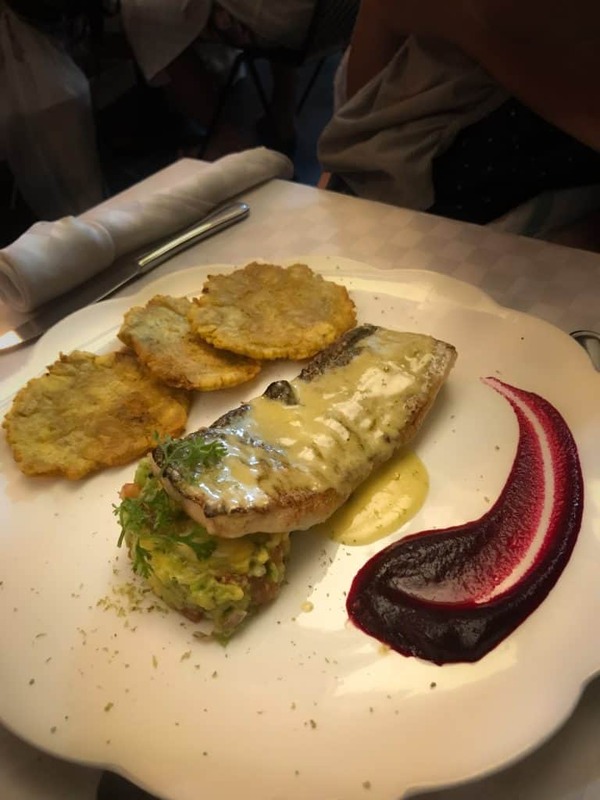 As I said previously, there is an abundance of tantalising eateries throughout Cartagena. We found a few gems that we went back to time and time again. Our favourites had a mix of cuisines. 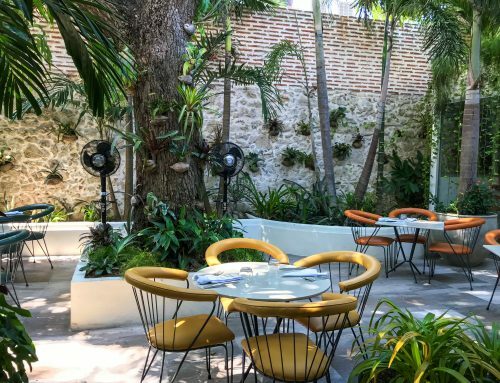 If you Google the best restaurant in Cartagena, it’s no surprise that Carmen and Moshi, its sister restaurant pop up. Situated inside an old colonial house with many preserved original features, are these two incredible fine dining restaurants. We had an amazing seven course tasting menu with a cocktail for lunch. 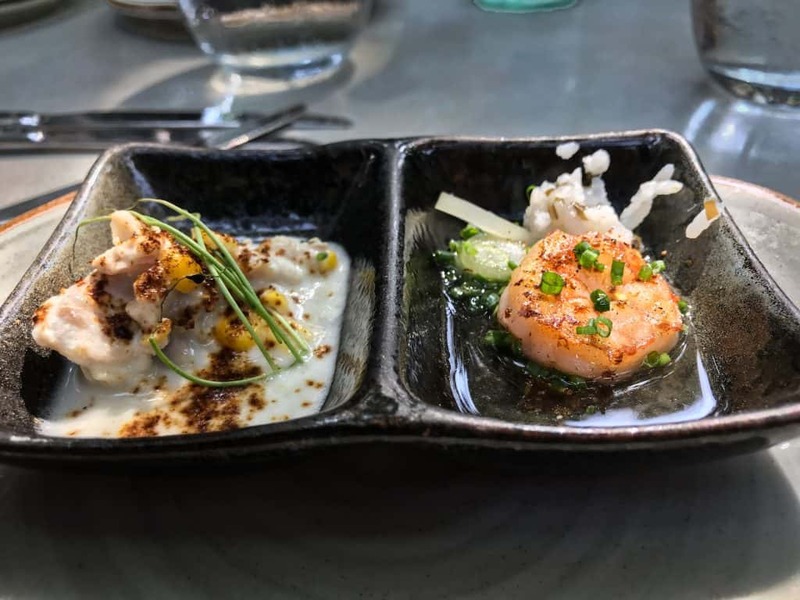 Seafood features heavily throughout the menu. It was an amazing experience, we felt compelled to write a full review here. The infamous ‘arepa’ is associated with Colombia. We struck lucky on our first day with the best one of all in downtown Getsemani. We tried a few after that and they were never the same. If you want the best arepa, you need to visit at the beginning of the evening. A couple of guys have a BBQ griddle and serve them up on the left hand corner of the below picture. 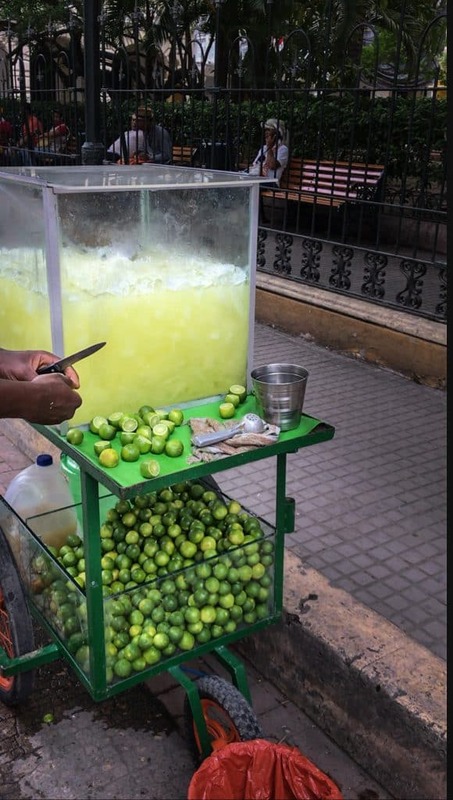 There are lots of street vendors floating around with a cart FULL of baby limes and loads of ice. They squeeze them so freak’n quickly and chuck the skins in the bin. The result is a huge container full of fresh limonade that is the perfect thirst quencher from the hot sun. Ahh one of my favourite places to eat was this little tapas restaurant on a colourful residential street in Getsemani. I loved the funky interior, the solar mural on the ceiling and the Amy WInehouse lookalike on the wall. The food and sangria was absolutely great. A couple of my favourite dishes were the eggplant sticks, granny’s croquettes and the patatas bravas. Foods that are good for the soul! They were really welcoming of us, despite having our two crazy loud kids. Being such a popular little place, it gets very busy, so its best to go for brunch to get a table. Whilst we were staying at the luxury penthouse, we nipped to Epcos cafe most mornings for our daily caffeine and breakfast fix. I don’t drink dairy milk, so I’m always excited to find places serving up almond milk lattes and more to the point, with ice! The breakfast is really great. Toast absolutely stacked up with smashed avocado, bowls of fresh tropical fruits and of course giant waffles. Again, because its so good, it gets really busy. If you are looking for something quick, super tasty, healthy and fresh for lunch. Pezetarian is the place to go. 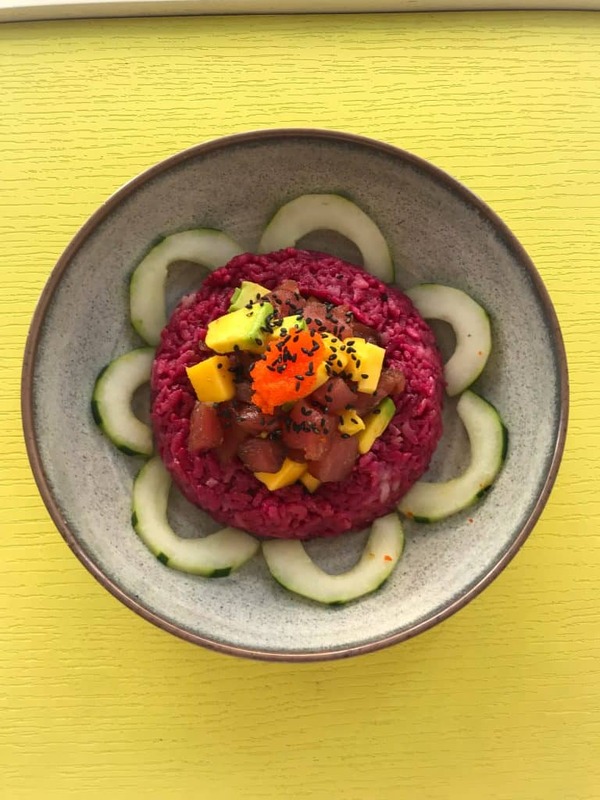 They serve up asian inspried foods with deconstructed sushi, named the sushi bowl, salads, rice and noodle dishes. They are some of the prettiest plates of fast food I’ve ever seen and we left feeling full and healthy! Along with delicious food, they have some special brews, made with fresh fruits and herbs. We tried the non-alcoholic sangria, made with watermelon and mint. It’s the perfect accompaniment. Cande is a traditional Caribbean restaurant with a dash of elegance and beauty. Framed with palm trees at the door, a lady with a red head scarf and pretty uniform lead us to our table. We were attempting our first date night in a very long time! Shellfish is the specialty at Cande, along with epic cocktails, tasty sharing platters and a fun but relaxed atmosphere. Inside the restaurant, its like a tropical garden. The wall of green leaves with potted trees and caribbean salsa dancers made it an intersting evening! Our friends told us about this awesome little place. 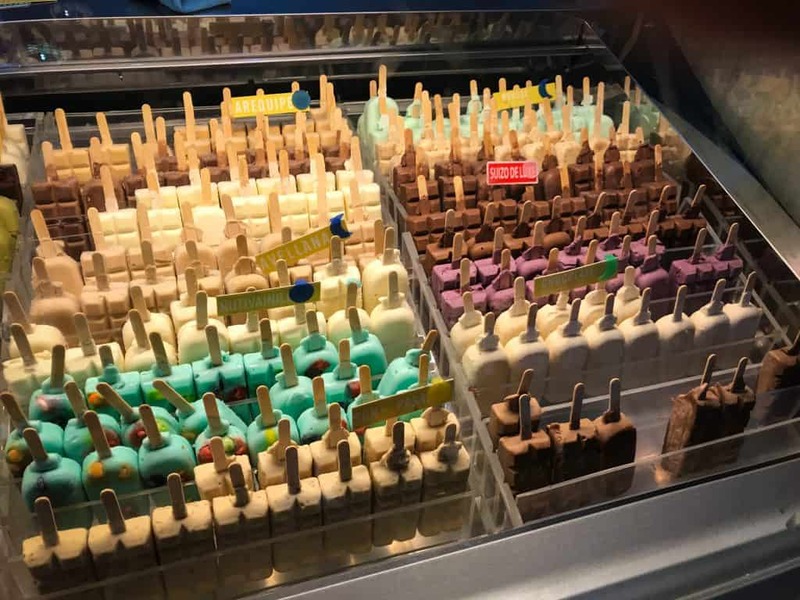 They have tonnes of ready made fresh popsicles to choose. From refreshing watermelon and mint, to cheesecake flavour, it was a yummy treat for the kids. They are not laced with sugar which is always a win. Ready to book? Find great deals on flights, travel insurance, hotels, reliable internet, and rental cars! 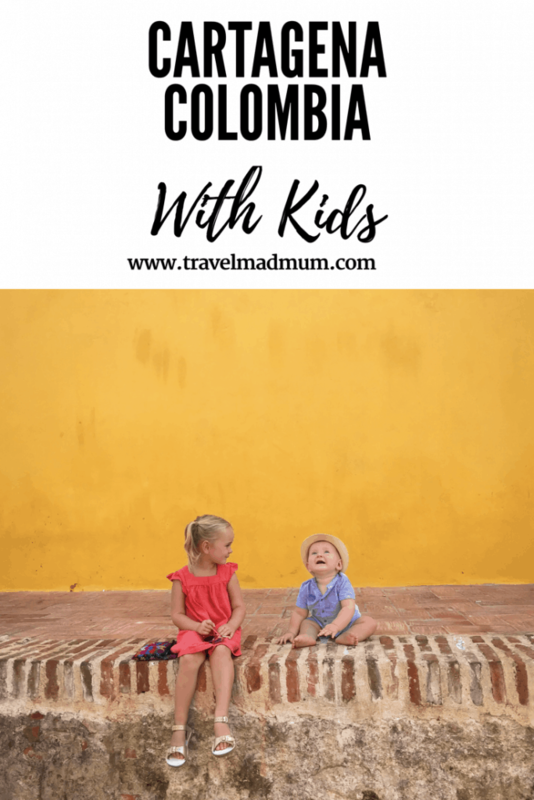 Have you found Cartagena, Colombia with Kids useful? If we’ve helped you in some way, we would love if you could help us too. In this digital age there is a demand for immediate information online. Being a patron is a new-age way of giving a small token of appreciation for this information, which takes time to put together, with no financial return. We offer exclusive access to blog posts before they are published as a thank you. We also offer travel advice and consultancy at different payment tiers. You can sign up to our Patron program here. Disclaimer: There are affiliate links in this post. Read my explanation of what an affiliate link is here and how it can help us. Ok so Columbia is now on my list!!! SO after drooling over your pictures for a week, I think I am going to book a trip here over my maternity leave! What did you do about transportation and car seats? I have never actually traveled with car seats before and just taken public transit but traveling with a newborn makes me a little more cautious. We normally walk everywhere but I am mostly worried about getting to and from the airport. Thanks! I read your blog about Columbia. My family and another family are interested in spending 2 or 3 days in Cartagena and then the rest of the week at a beach resort nearby. Do you have any recommendations on where to stay? We are 5 adults and 4 kids traveling together from Atlanta. Thank you for your post. We are about to spend a month or so in Colombia with our daughter. Can’t wait to get there!! Thanks so much for this article! My husband and 2 kids are heading there at the exact same time 1 year from your arrival (news years 2019) my husband has HUGE reservations going to Colombia, even though my background is Colombian. Is is nervous around the crime and thinks we’ll be targeted because our children are quite fair etc. I’ve sent him this article to put his mind at ease. Everything you wrote will be super helpful to help me entertain the kids! Thanks again! This was really helpful, thanks! 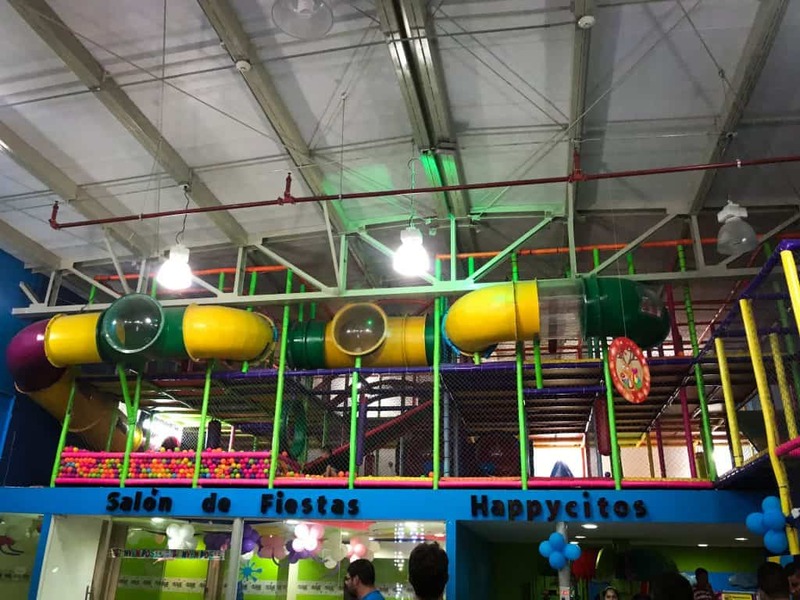 Just one quick note to add, the mall with the great stuff for kids in air conditioning by the castillo is the Plaza mall, not the other one (yes there are two right by each other and, yes, going to the wrong one first did cause a huge meltdown)!